“In those days a decree went out from Caesar Augustus that the whole empire should be registered. This first registration took place while Quirinius was governing Syria. So everyone went to be registered, each to his own town. And Joseph also went up from the town of Nazareth in Galilee, to Judea, to the city of David, which is called Bethlehem, because he was of the house and family line of David, to be registered along with Mary, who was engaged to him and was pregnant. I know we’re already a few weeks removed from Christmas, but there’s still a part of the Christmas story that has stuck with me past New Year’s and into 2016: I still find it hard to imagine how Jesus, the savior of the world, was born in a feeding trough. I’m still baffled that He ended up being born in a place that was probably the filthiest and least sanitary place in the entire town of Bethlehem. Why there? According the Luke 2:7, it was because there was no room for them at the lodging place. It was full, a ‘No Vacancy’ sign probably plastered to the front door. There was no place for Mary and Joseph anywhere in Bethlehem, so they had to settle for a filthy manager and rest Jesus in the same contraption that goats and sheep eat out of. No one in their right mind today would think that these conditions are suitable for anyone to be born in, let alone Jesus. Yet God allowed it to happen, probably to show us something even more important. We don’t know if there was an actual innkeeper, as depicted in countless numbers of Christmas plays over the years, who turned Mary and Joseph away from the ancient Israel version of Holiday Inn. But for some odd reason, I've thought a lot about this hypothetical innkeeper over the Christmas season. The question that stuck with me is this: If this innkeeper did in fact exist and did turn Mary and Joseph away because all his rooms were booked, did this person ever realize what they missed out on being a part of? He probably had no idea about Jesus, who He really was or that His birth would be one of the most important events in the history of the world. Yet, in this scenario, the innkeeper missed it simply because he didn’t have any space to spare. Throughout the holiday season, I thought I had become a lot like this innkeeper. I filled my life with so much stuff that there was no space for Jesus anywhere. Sorry, Jesus. I have all these final projects for school to do and this huge story I have to finish for work and all this Christmas shopping to do and all these friends to visit and oh my goodness, look at the time, I gotta go but we’ll catch up later, okay-thanks-bye! 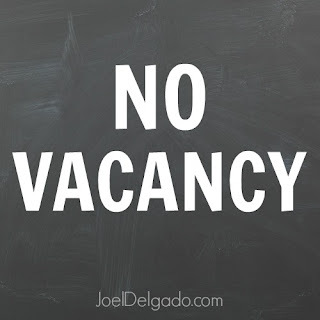 We make a huge mistake when we post a big ‘No Vacancy’ on the doors of our lives when Jesus is knocking, because we will miss out on something really special and not even realize it. We miss out on Him. Back to the manger and the feeding trough for a second. Jesus entered the world in, literally, the messiest situation imaginable. Imagine how chaotic that scene must have been: the pain Mary must have felt while giving birth while goats and sheep and camels were milling about nearby, the smell of a filthy barn thick in the air. If the innkeeper had opened up any space in that lodging place, not even a guest room but maybe even the kitchen or the laundry room or any room, Jesus probably would have been born at that lodging place instead of being placed in a feeding trough. Mary and Joseph weren’t looking for a presidential suite at the Ritz-Carlton; they just wanted an open door. Jesus cares about you more than He cares about how messy or crazy your life is at the moment. He will come into the messiest, craziest, and most chaotic situations imaginable – if we allow Him to. We don’t have to turn Him away or wait until we clean things up before letting Him in. In 2016, I want to make sure there is always room for God to come in and work in me. I don’t want to wait until the ‘perfect’ time to do so. There is no such thing as the perfect time and if we wait for it, it'll never come. I don't want to miss out on what He wants to show me because I didn't think I had any room left to spare. I’d rather have Jesus be in the middle of everything that’s going in my life, no matter how messy I think it is or how embarrassing it might be, than shut Him out altogether. He is the only one that can truly bring about lasting change and a lasting peace, and He can only do that when I take down my ‘No Vacancy’ sign and let Him in. Amen. Great message and beautifully written!